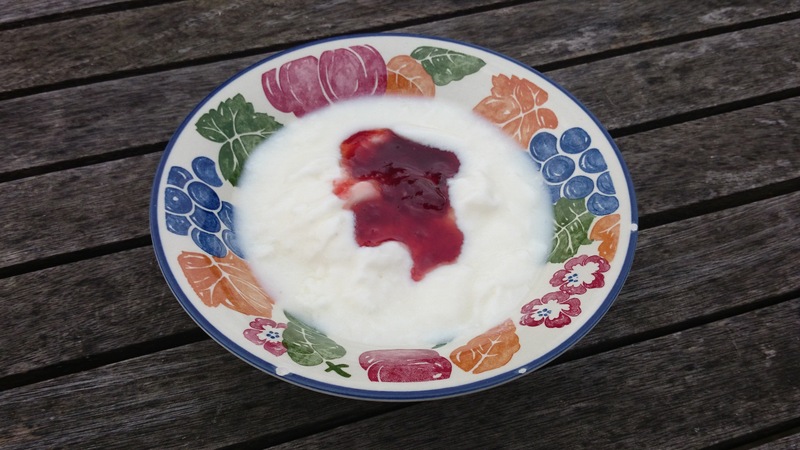 Homemade yoghurt served with jam. There are two main potential problem particles in dairy. One is lactose (you’ve probably heard of lactose intolerance). The other is Casein, which is less widely known. Some people also have a milk allergy (different to an intolerance), and it’s also possible to react to Whey. Lactose – Lactose is a sugar found in milk (and milk products). Casein – Casein is a milk protein. You may remember from previous posts that Gluten is a wheat protein. It is quite common to find that if you have a gluten sensitivity you also have a casein sensitivity, since the two are handled in a similar way by the body. Here is a great post from ThePaleo Mum which explains Gluten Cross-Reactivity to dairy and other foods. Whey – Whey is another milk protein which can cause similar reactions to casein. If you are using whey protein and are reacting to it, then you could be reacting to the whey, but it could also be because the product is not 100% whey, but also contains lactose and you are reacting to the lactose (confusing isn’t it). I have been making home made yogurt, which I ferment for 24 hours, for many years. This supposedly leads to all the lactose being converted to lactic acid by the yoghurt making bacteria, and hence it is safe even for those who are lactose intolerant. I plan to write more about this in a future post, but in the meantime, here is the information that got me started on this path. When I first became ill yoghurt making was one of the many activities that stopped. However, as soon as I was able (probably 18 months after my crash) I began making the yogurt again. A few months ago I removed all dairy from my diet for a period of 2 weeks and then reintroduced it. I did not notice a difference in symptoms on removal or reintroduction, so I therefore do not think I am intolerant to lactose, casein or whey. I do not avoid dairy, and regularly eat my homemade yoghurt, and I occasionally enjoy some cheese or a creamy dessert. However, I don’t go out of my way to consume lots of dairy. I am focusing on a nutrient dense diet, and most of the time I think there are other foods that will benefit me more. When my daughter started her gluten free diet our nutritionist warned us that many people who react to gluten also react to casein and hence she may also need to avoid dairy. We’ve never removed dairy completely from her diet, if you’ve read my post about our experience of going gluten free, you’ll know that given the state of my health at the time it was challenging enough to remove gluten. Writing this makes me think that we should probably do a trial to eliminate dairy and reintroduce it and see if there is any reaction, but this will rely on her co-operation. Over the last few months we have also been trying to work out the cause of my youngest son’s regular tummy aches. After excluding gluten from his diet we noticed that the tummy aches came when he ate dairy. We therefore excluded gluten and dairy for 2 weeks (he was fine) reintroduced gluten (he was fine) and a week later reintroduced dairy (he was not fine). Over the summer there have been several instances of him eating dairy and getting tummy pains. However, he seems able to consume my homemade yoghurt with no problem. This makes me think that he is lactose, and not casein intolerant. I am still experimenting to see what he can tolerate. For example I read that many people with a slight lactose intolerance can tolerate butter, because it is mainly the fat portion of milk and hence does not have much lactose. However, his consumption of chocolate brownies made with butter did not have a happy ending. That was 2 weeks ago, so I am now going to try some whey protein isolate to see if he can tolerate that. Again this is supposed to be a different fraction of milk, with very low lactose. I consulted with our GP before I excluded gluten, and my son had a coeliac test (which was negative). At the end of the summer we went back to the GP to tell her the conclusion we had reached, but she does not want to do any testing to confirm lactose intolerance, and is happy for us to continue as we are. All our meals now need to have gluten free and lactose free versions and packed lunches are even more challenging than before. It’s a good job I have more energy because an awful lot of it is going into thinking about and preparing food. Over time I hope to get better at gluten and dairy free options so that it is less effort. Having a daughter who is highly allergic to dairy means that we are v familiar with dairy free options. Most things can be baked as usual using ‘Pure’ spread instead of butter. The soya one is best for baking. Oat milk (oatly) or rice milk are good on cereal and oatly do a good chocolate milk. For easy snacks ‘value’ ranges of biscuits can often be dairy free – bourbons, Nice, ginger nuts etc. Suprisingly ‘party rings’ are fine too. Crisps-wise apart from Ready salted, walkers salt and vinegar and prawn cocktail are milk free as are some brands of frazzle, hula hoops and chipsticks. Alpro soya yogs are great as are their choc puds. They do a nice custard. Whilst Cheesly cheese is vile it is actually pretty good melted on a homemade pizza. Jellies, haribo and jelly babies are fine. There is a dairy free icecream that’s quite good – I’ll look up the name for you. That sounds v junk heavy but I find main meals v easy, but snacky treaty things were where I needed tips as they are few and far between for dairy free kids and are an important part of kids ‘fitting in’ at parties etc! I always have a few replacements in my handbag for cafe visits or impromptu treat alternatives just in case! We’ve already discovered oat milk. My son has tried almond, rice and oat milk and prefers oat milk. We’ll steer clear of the biscuits, because they cause my gluten-free daughter to feel she’s missing out. We haven’t tried the Swedish Glace, but I did find some Lemon Sorbet in Sainsbury’s that is dairy free, which I’ve tucked in the freezer for when we have ice cream. I found with going gluten free that as you get used to substitutions and replacements it gets easier, but I’m not fully there yet with dairy, and I’m having to check labels very carefully at the moment. Also I keep discovering that not all the people we socialise with know yet, so I keep having to apologise when he can’t eat the food they offer. All our friends seem very understanding of the situation, despite me changing him from a gluten free to a dairy free diet over the summer. Once I explain that he has been having regular tummy aches and this seems to have solved them, no one complains (at least not to my face). Ice cream is swedish glace! If u have any questions about dairy free, I’m always happy to answer as best I can. As I say we’re 5 years into egg, dairy and nut free eating.